In our last weeks of class, we had a parade of business instructors teach us about branding, marketing, web presence, accounting, writing resumes, and more. We also got to choose to to spend four days in a smaller group with either a personal chef, a restaurateur/food product developer, or a food media expert learning the things that would set us up for success in our chosen career goals. I chose to work with Amanda Love, a personal chef, and she had many great pieces of information which are going to help me get my personal chef business going. It was great to be in a small group with Amanda because we were all focused on doing personal chef work and got to ask her questions which were on our minds. That time was really valuable and I appreciate her knowledge and encouragement. In some ways it was my favorite part of the whole school curriculum because it was the timing was so right based on what I needed at that time. It’s really helpful to have connections and mentors in life, especially when embarking on career change. 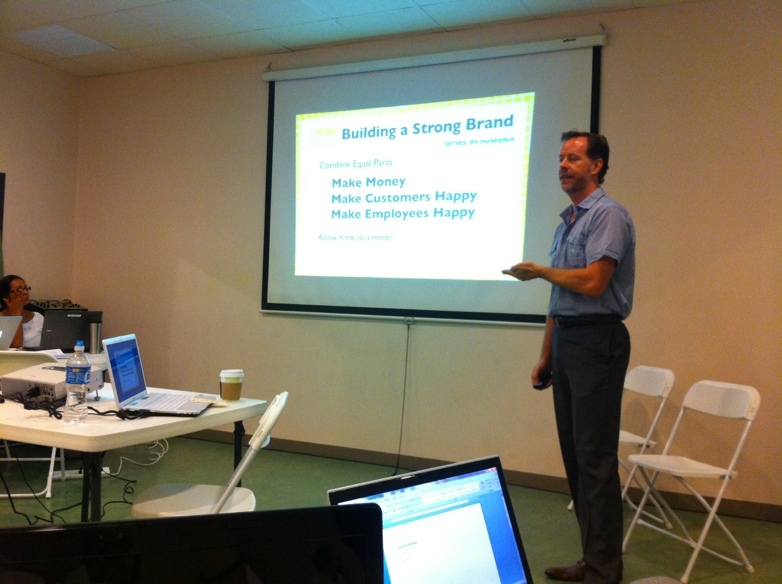 Below: John Moore of BrandAutopsy talking about developing a brand. Below: Scott Price of SRP Consulting talks about consumer product marketing. Below: This guy, Justin Follin, blew me away with his perspective. He came in to talk about public speaking but what he shared with us was useful far beyond communication. This guy is a straight up life guru. He touched on confidence, emotions, duality of self, meditation, and presence. Half the class was in tears by the end, and I mean that in a good way. So, I set the intention that this was a week that good stuff was going to happen for me. It seemed to have worked. 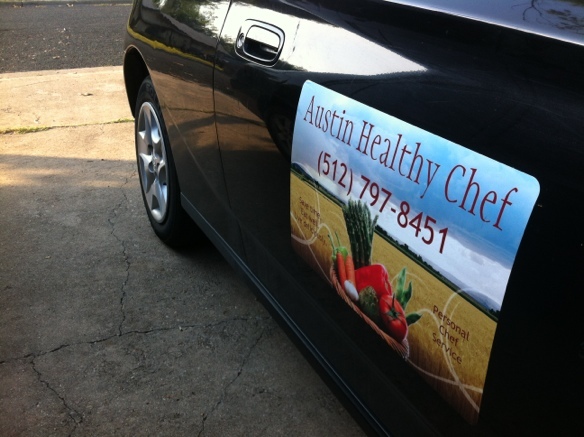 I’ve been out this week beating the streets in the Chefmobile, trying to make some connections to promote my personal chef business. I just spoke to a dietitian today who plans to refer me to one of her clients who eats really bad restaurant food for every meal. Below: Marketing myself like a champ. Next – urinal cakes. I am also trying to see if UT will rename the football arena currently known as Darrell K. Royal Field to Austin Healthy Chef Stadium. I have connections in high places. 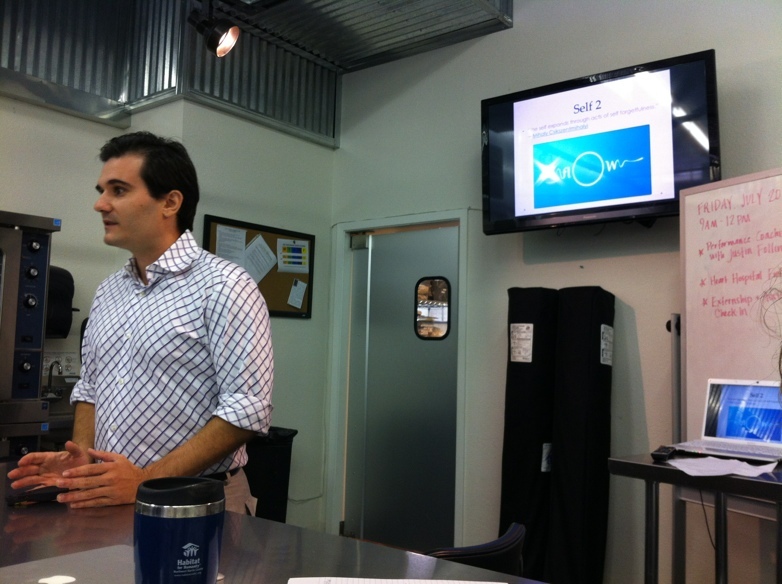 This week I went to a meeting for entrepreneurs called the Holistic Chamber of Commerce. Good people and good connections. I heard back from my externship site this week I’m starting that work Sunday. Not excited about not getting paid for 160 hours of work. But I’ve had a charmed life so far so maybe this evens things out. And it’s kind of how things go in the food industry. In really great news, I have a personal chef client! I’m going to begin cooking for him at the end of the month. I met him at the school’s culinary showcase we did a few weeks back. I know he’s going to love it, but I need to do well do keep it going. I suppose that’s true of any work you do. 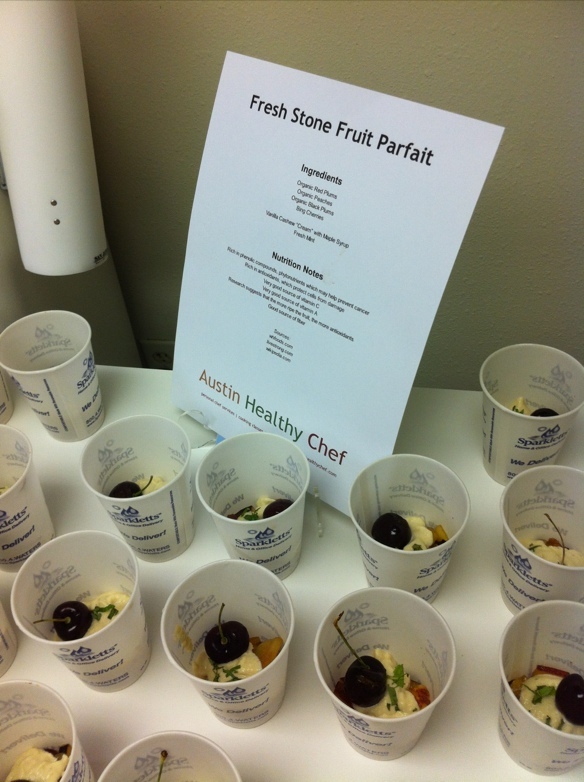 Last week, I provided a simple fruit parfait with cashew cream for a corporate function. I made a couple of connections that could turn into paid work for me, which is nice. 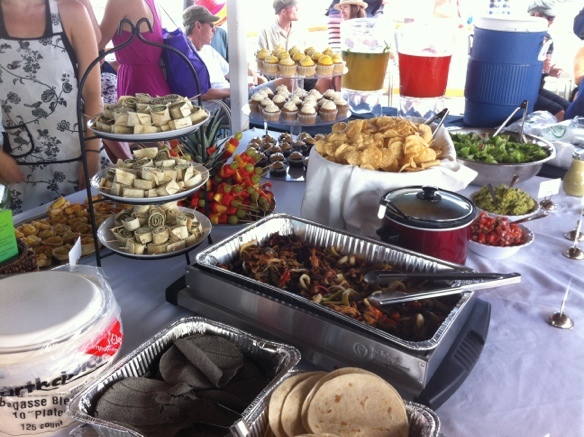 Below: The budget for serving ware was not very high, but the food was delicious! 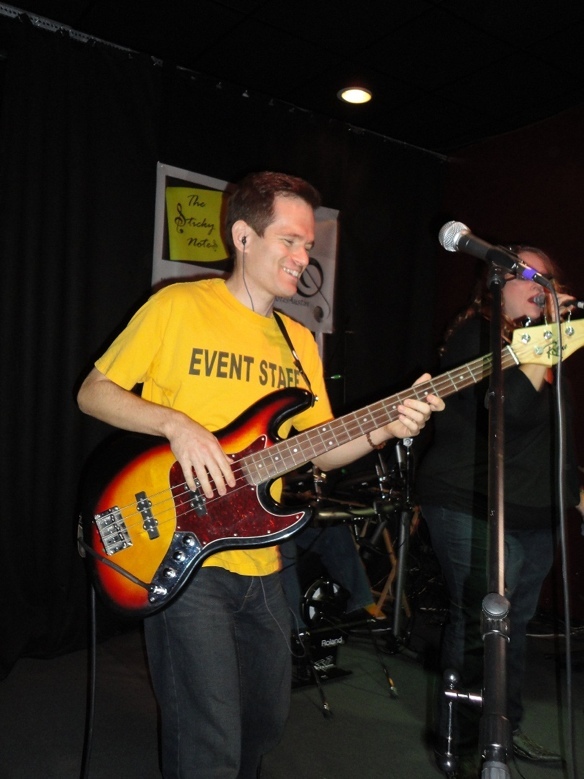 And my band, The Sticky Notes, have secured a few gigs through November and we’re having a lot of fun. Below: Am I awesome? Yes I am. Having tons of fun playing with the band. Check out a promo video. 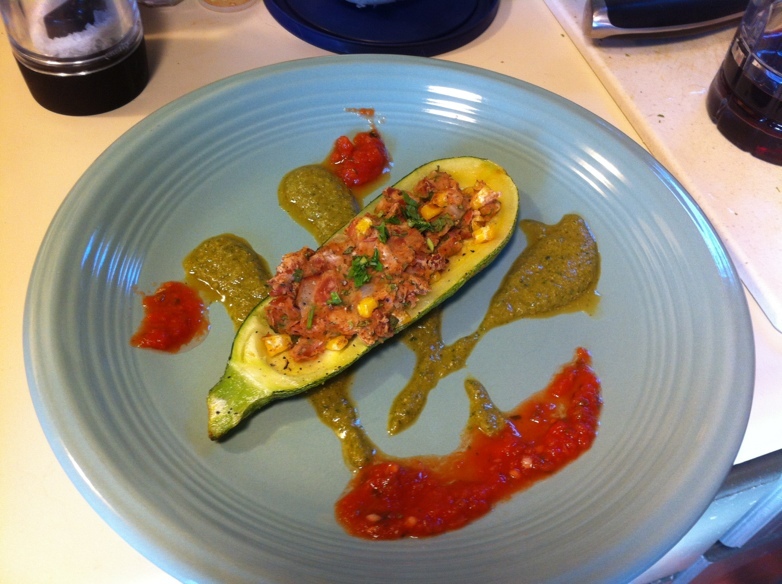 Below: A stuffed zucchini I made during the week. 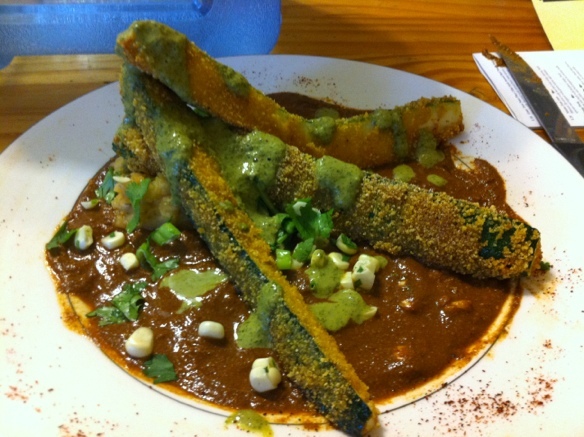 The green sauce, a cillantro-lime dressing, was from Christy Morgan’s book, Blissful Bites. 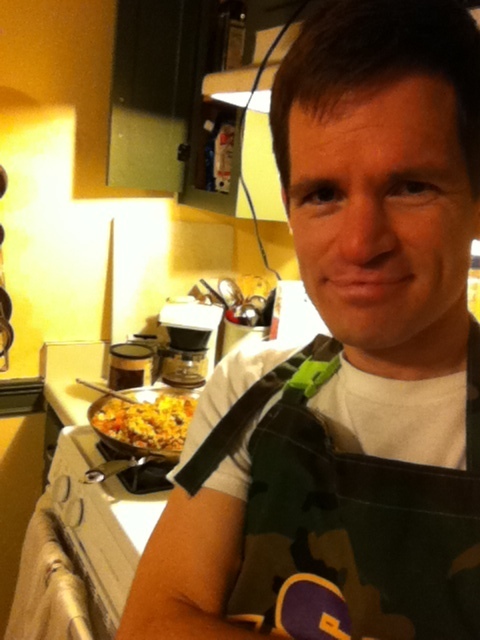 Rewind six months or so: I quit my job and started culinary school. 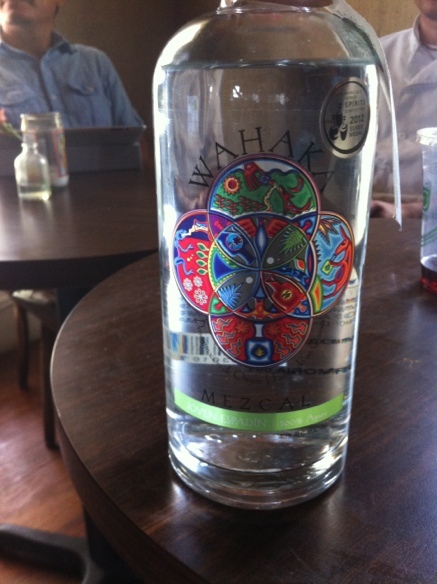 Probably the boldest move of my life. Back then, I had not much of an idea what I wanted to do except work with food and support people in becoming healthier. I had no idea how to go about that. One of the cool things about being a student at The Natural Epicurean is that we get access to really cool people who are doing cool things with food. One such person is a fellow blogger, foodie, and career-changer, Michael Natkin. 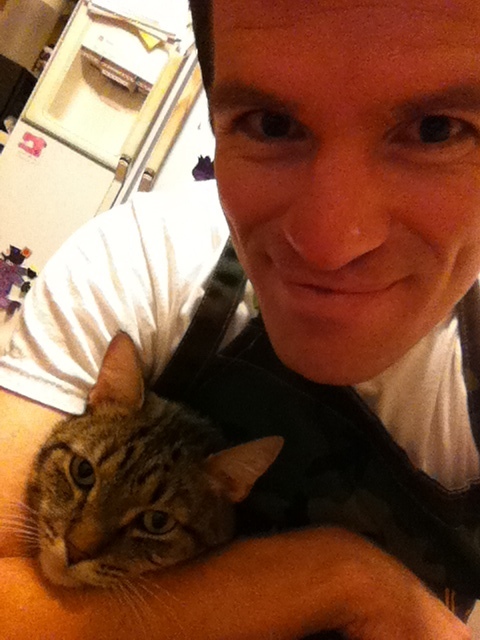 Michael is the man behind Herbivoracious, a well-read blog featuring vegetarian food. Herbivoracious has been recognized by the New York Times and Saveur magazine for it’s outstanding writing and recipes. Michael said the blog gets about 6,000 hits per day, which blows my mind. Michael has been blogging for a few years now and thanks to his hard work, he landed a book deal. He is now marketing his cookbook across the country, doing public events in several major cities. He just quit his job two months ago to support his change into full-time food work. 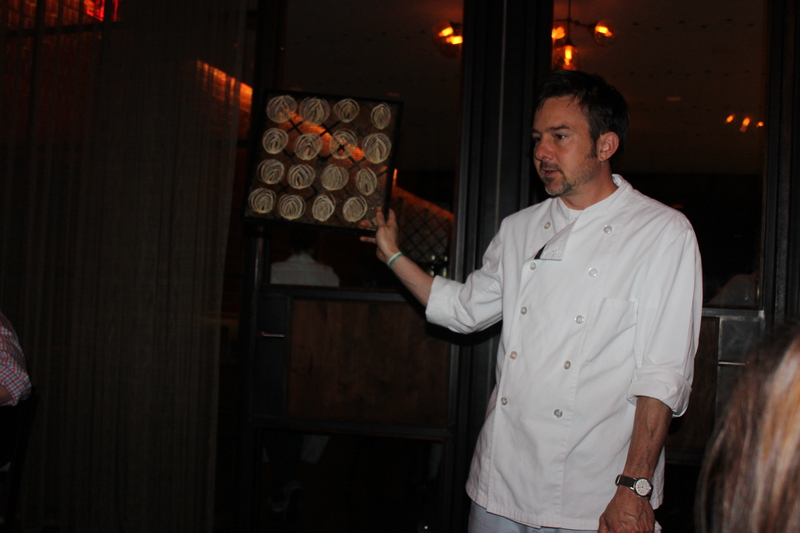 We were lucky to have him do a cooking demonstration at The Natural Epicurean where he talked about blogging, cooking, and changing careers – all topics that I am quite interested in these days! 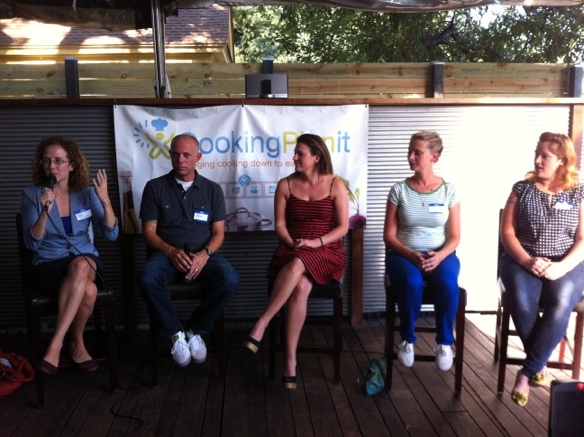 There were a handful of Austin bloggers present, as well, from the Austin Food Blogger Alliance. 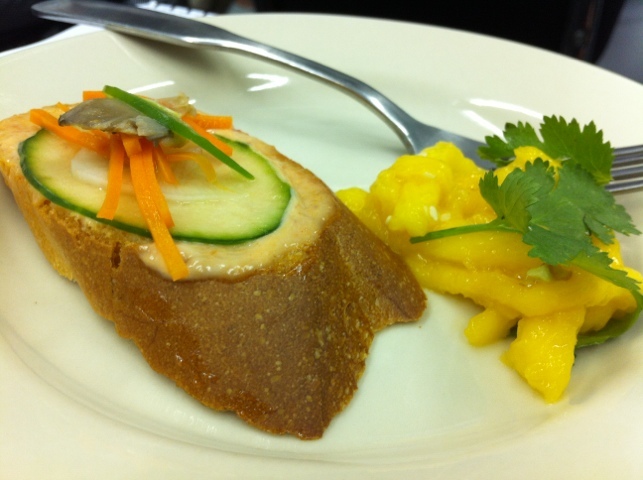 Michael cooked a bahn mi and a mango salad, both delicious! 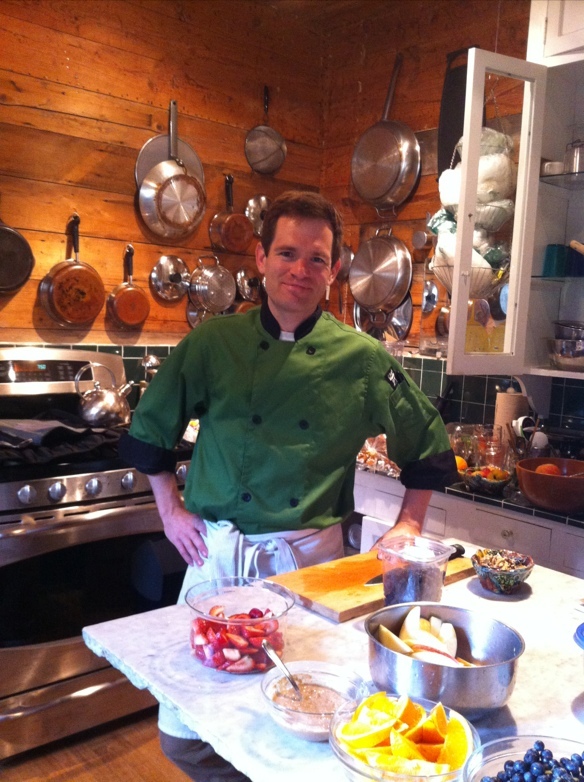 I conducted a cooking class for some friends last week – my first class ever. I was very excited and had a great time. We cooked a quinoa salad and Thai spring rolls with a peanut sauce and I showed them some steel cut oats, as well. I also brought some raw almond-flax muffins with a lemon-blackberry icing. This is something I would never have done had I not started culinary school, so it was kind of a milestone in my career journey. I really had a lot of fun and felt fairly comfortable. I wish I could have had my ingredients a bit more prepared, but otherwise it went very well and everyone seemed to learn and enjoy the presentation. Below: Making spring rolls with lots of greens, herbs, and vegetables. 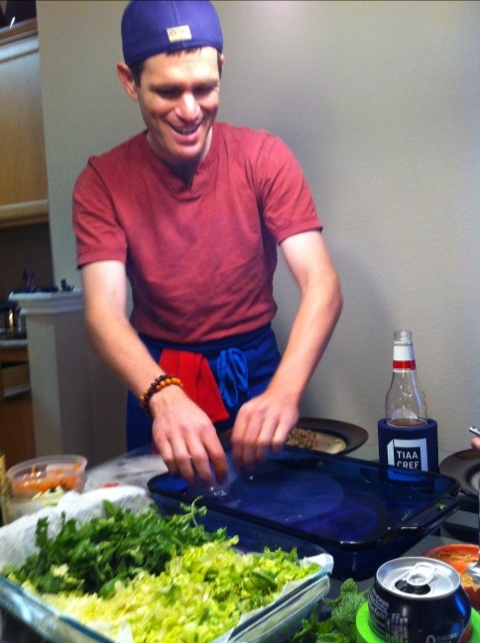 Here I am dipping a rice paper wrapper in hot water to soften it for the rolling process. Amy Ramm is a graduate of my culinary school, The Natural Epicurean, and also the founder of Nada Moo!, a vegan ice cream company that she started here in Austin, TX, and that she has grown to multi-state distribution. She actually attended The Natural Epicurean way back when it was almost all macrobiotically based and — big news here — she recently sold her stake in Nada Moo! to focus on the next chapter in her career. I sat down with Amy to talk about how she got Nada Moo! off the ground and into widespread distribution, what it took to keep it going, and where she’s headed next! 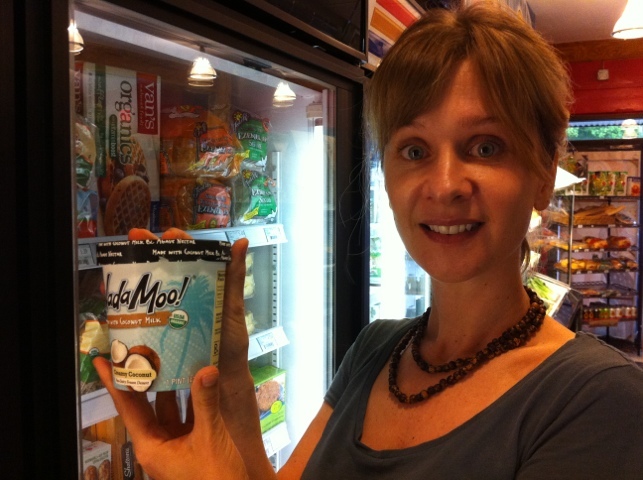 Below: Amy Ramm, holding a pint of Nada Moo!, the coconut-based ice cream product she developed over eight years ago. Tell me about the start of Nada Moo! 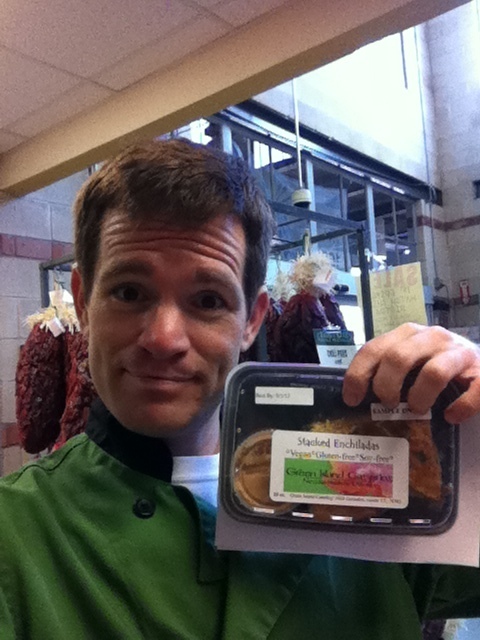 I was an aspiring artisan baker and pastry chef before I became a student at the Natural Epicurean. I was going down this path of learning how to put butter, flour, sugar, and eggs in everything and my sister was consulting with a nutritionist about her bad allergies that were getting worse. So she was going through an elimination diet and I was working with stuff that was very different. She came to me and asked me to change up some recipes so that she could eat them, but I wasn’t learning any of that in the training I was getting. So, I became more curious about how to do that. And I also realized that a lot of people were enjoying my baking work but who also may have had allergies without realizing it. So I decided to become a natural foods chef. At that time (ed., about 10 years ago), the Natural Epicurean was very much geared toward the home cook. 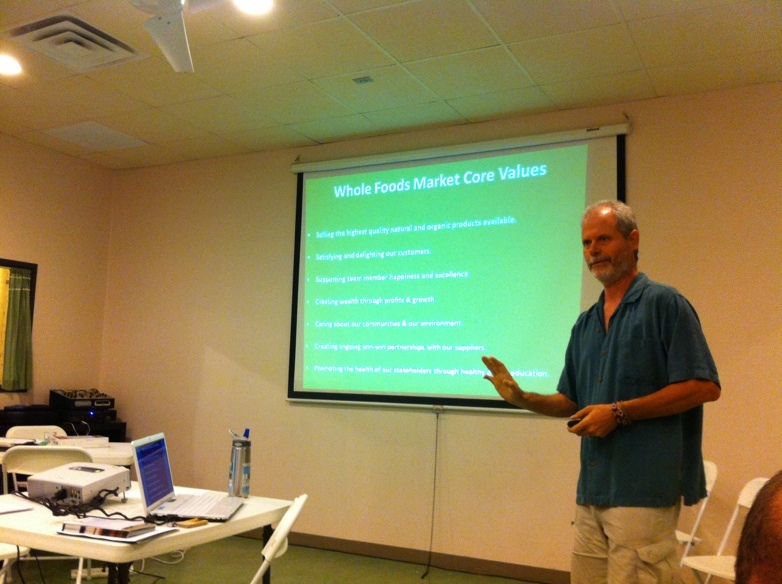 I also studied Healing with Whole Foods by Paul Pitchford to learn more about healing foods.